The North Burnett Field Archers Trad Weekend is set for the 4th & 5th August 2018. Come and enjoy our grounds and our traditional county hospitality. Flyer to be posted in the coming months. Will be there again Tim was a top weekend last year with all the different shots to be had. Had a great weekend. Justastik Arrow Craft, Its all about the Wood. Travelling to NBFArchers, socialising, sleeping, shooting, socialising, sleeping, shooting, socialising, sleeping, shooting some more then travelling home. I would love to be an expert, but experience and lack of knowledge holds me back! Raven Vanquish 62" TD Recurve 44# @ 28"
Beaver 64" Longbow 41# @ 27"
Bear Montana 64" Longbow 50# @ 28"
Win & Win Winact ILF Riser and Win & Win Pro accent ILF carbon foam limbs 48# @ 28"
Have confirmation: this event, as per last years flyer, is a cross participation shoot - card required. Last edited by little arrows on Tue Jun 12, 2018 7:46 pm, edited 1 time in total. Hey Rod I just had another look to make sure they hadn't changed something and the full flyer on the clubs FB page is the same as the one that is attached to this thread which reads Cross Participation Event, there is a post where someone has typed words yes, I will grant you that, however it's the flyer that is on the sites. 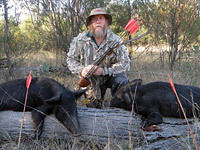 North Burnett Field Archers Has posted a new Trad. Weekend flyer on our Facebook page the only change is that Bendigo Bank is now sponsoring our trophies and we will now have a perpetual shield for overall top score for the weekend . Be the first shooter to get there name on it. We have burnt a lot of the spear grass so there will be less lost arrows. here is the new flyer, as noted, only the Sponsorship for the Trophies has changed. It is still a cross participation shoot - so a card is required. Rummaged through the shed and found some mixed half sets of different wood arrows so am ready for this shoot. I think some may have been from the Mary Rose or what ever that boat was called with the old longbows on it. Cant wait it will be great to catch up with the old faces again. So I see on the flyer that your flu flus need blunts and mine have field points on them. I guess the best way is to have some with each. You got it Kimall, some of us have a set of each - or you can slip a blunt over your point - yes the front will be a little heavy, you'll cope I'm sure, and you've got 3 days to sort it. I rang the local shop and he has a few slip on blunts so all sorted. Cant wait Gringa to catch up and that rascal Amos is coming too. ...2 ...sleeps to go. Have a good one.